After our April 90th anniversary issue, which featured a 1940 map by former Art Director George M. Avey on the back cover, we received an email from reader Alice Wilcox. "I got all excited when I saw [the map]," she writes, "because I thought I had a copy of this map hanging on my wall. 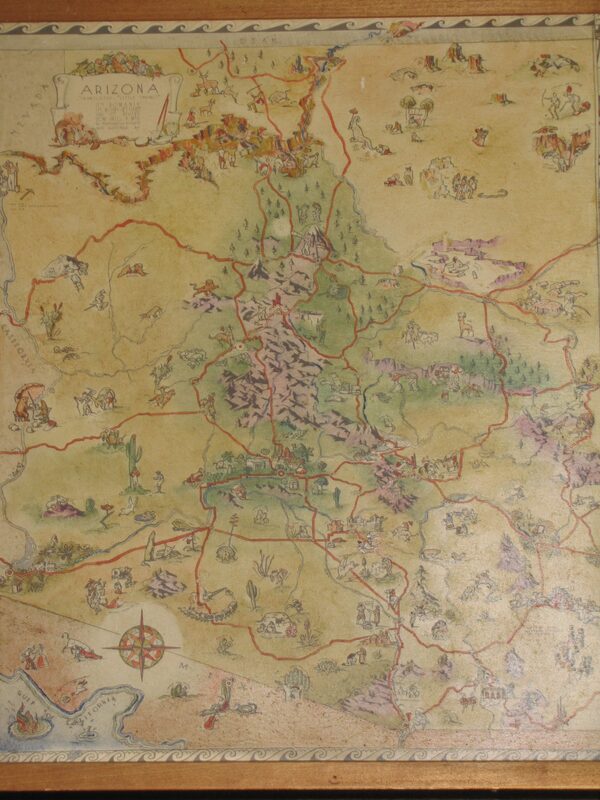 However, upon closer inspection, I noticed that it is not the Avey map, but an older version of the map drawn by and copyrighted in 1933 by Katharine K. Cahill." Neither Alice nor we could find much information about Ms. Cahill online, and to the best of our knowledge, she never contributed to Arizona Highways. But it's not a stretch to think Avey could have drawn inspiration for his distinctive illustrating style from maps like this one. Alice was kind enough to pass along a few photos of her map; you can see them below. Thanks for sharing, Alice. And if anyone out there knows more about Ms. Cahill's career, feel free to share it with us in the comments.